For those of our readership not familiar with the charity ‘GamCare’, could we commence this interview with an explanation starting with when it was established and how it is funded? GamCare was established in April 1997 with the intention of helping and supporting those affected by problem gambling, and also to help the gambling industry to better understand how they can bring social responsibility into the heart of their businesses. There has certainly been a change in the landscape of the gambling industry since then, however our core focus is still the same. We provide information, advice and support for anyone affected by problem gambling across Great Britain, and we also work to minimise gambling-related harms by providing a range of training, consultancy and targeted outreach work. The National Gambling HelpLine and our network of treatment services are currently funded by GambleAware, and we also receive donations from industry, individuals, trusts and foundations towards our wider work. What is your background prior to taking this role? I joined GamCare in January 2018 and my background prior to that was quite varied. 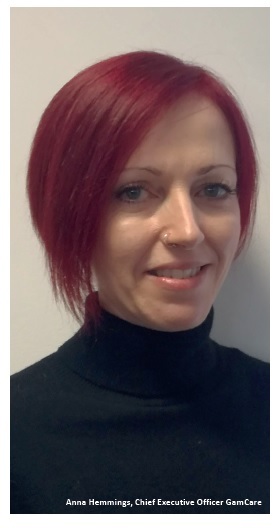 I’ve worked mainly in substance misuse and with families with complex needs. I have experience with both adults and young people, in the community, in custody and across charities, local authorities and the NHS. I have also worked in the commercial sector, and find it useful to be able to see how different sectors function. I’d been in senior roles for some years, so my background has prepared me well for this role as I have a good understanding of charity governance and of managing change and complexity. I’m also the chair of a small charity close to where I live, which helps give me a Board perspective on things. Can you outline your aims and ambitions for this role? I’ve got huge ambitions for the role! I’m very passionate about it, as are my team, and we’ve got lots of plans for now and for the longer-term. Our biggest priority is always ensuring that the people who need our help can access support and treatment easily, free of charge. Currently, it’s estimated that around 2% of the people affected by problem gambling are seeking support. We are working hard to reduce the barriers people may experience in reaching out for help, in order to triple the number of people we support over the next three years. We are also aiming to increase our engagement with ‘hard to reach’ groups, as while they don’t frequently access our services, their need may be more acute. This includes those within the criminal justice system, BME (Black and Minority Ethnic) groups, as well as women. This goes hand in hand with increasing the range of treatment options we can provide. The more choice we can offer to our clients, within a solid evidence base, the better. Our treatment options are high-quality, and our outcomes are very good, so when people do engage with us we can certainly help them. However, we do want to encourage people to engage with us sooner; many of the people accessing our services are at a crisis point, and we recognise the need for earlier interventions. Increasing awareness of problem gambling, and the ways that people can access support, is key. This encompasses at-risk gamblers too – we want to prevent problems from escalating any further. We have captured all this and more in our new organisational strategy. It’s going to be a busy few years! How closely do you work with land-based and online Casino operators? We have good relationships with lots of operators, and we provide training and our current Certification to several casinos. We also have good relationships with the National Casino Forum, Playing Safe and the SENSE scheme, which we are keen to grow. We have recently reviewed our training and Certification, with a view to pushing innovation in social responsibility and player protection across the board. Look out for some new developments in that area in the next few months. What responsible gambling measures have you seen in the land-based casino sector that have impressed you? Depending on the size and operation of the casino, there will be a blend of data-driven systems and controls and human interaction which forms part of good customer service. Ultimately, there needs to be a willingness to understand social responsibility and to work hard to safeguard customers. For responsible gambling measures to be effective, we feel that they must be completely integrated into the business, part of the organisational culture. The tone ‘from the top’ needs to be clear, and social responsibility needs to be part of everyone’s day to day, not just a job for the compliance team. What more could land-based casinos do to enhance responsible gambling amongst their customers? Collectively, we need to work to make gambling activities as safe as possible. This means a mixture of approaches – helping customers understand the tools which are available to them to help them stay in control of their gambling, providing information about risks in a clear and accessible way, and ensuring that if someone wants to take a break they can step away easily for as long as they want to. Lots of operators are also proactively working to understand markers of harm for their customers, so that they can interact with those customers appropriately and signpost them to support if they need it. A better understanding of problem gambling and how to motivate behaviour change is helpful for operators – that’s why we have launched a new training course focused on this, which is receiving great feedback from staff teams who now feel empowered to take the lead in safeguarding their customers, and in turn providing better customer service. 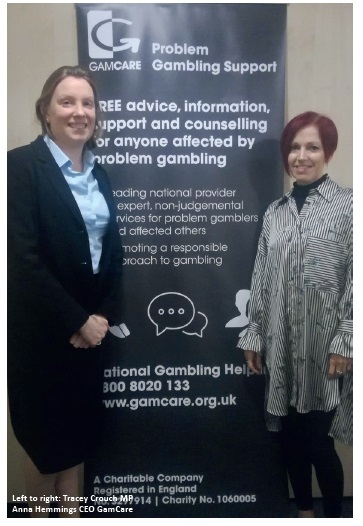 GamCare is also working with several self-exclusion schemes, including SENSE, to look at how we get people who have concerns about their gambling to our Advisers on the National Gambling HelpLine as seamlessly as possible. Our new training is a precursor to being able to transfer calls directly to the HelpLine so those customers receive the help they need quickly and easily. The website is very often the first point of contact, and gamcare.org.uk is clearly formed of vast insight into those affected by problem gambling? Yes, it is, and we get more than 2 million unique visitors every year now. More than 30,000 people are registered on our Forum, with around 2,000 new threads started each year. More than 10,000 people also connected to our services via our NetLine last year, receiving one-to-one support via web chat. We also provide a self-assessment tool via our website, which more than 20,000 people use over the course of a year to try to understand the areas they may need to focus on with regards to their own gambling behaviour. Our website is an extremely important part of our service, and it is currently in need of a refresh. This is something we will be focussing on in the next year, in consultation with our teams and our service users. How does the Charity promote itself to gamblers, especially those that seek advice? Raising awareness of our services is one of our biggest challenges. We promote ourselves in as many ways as possible, including in venues (such as machine stickers, on screens and via posters and leaflets) and on gambling sites, plus a mixture of print and digital promotion channels. We also promote local face to face services through our partner network and their contacts, and we’re actively working to get more Local Authorities engaged as they have great local access to harder to reach groups. We are also now able to offer direct transfers to the National Gambling HelpLine from customer service teams once those teams have received our training. Are you in partnership with Responsible Gambling Week? Yes, we are supporting the Week and will also be hosting free training at various national locations as part of our Youth Outreach Programme during the week. Do you think society should have a better understanding and appreciation of addictions than they do currently, and do you think more can be done to educate and inform the public? It’s important that we work hard to raise awareness of problem gambling, especially as there are not the visible signs you get with drug or alcohol misuse and it can therefore remain a hidden problem for longer. As I mentioned, we are encouraging people to seek support sooner, but also to talk more openly about gambling. The more we discuss what gambling is, what the risks are and how to manage them, the more we can raise awareness of what a problem might look like and how people can tackle this. Like many mental health issues, people affected by gambling problems often suffer in silence and become very isolated – the more we get people talking and understanding the issue, the better. Earlier intervention is one of your key objectives. What strategies are you looking to implement with gambling establishments online and land-based to assist with getting early intervention? We need more visibility – more awareness of the problem and more awareness that help is available. We are working to help everyone understand that the quicker someone finds help, the less the impact of a gambling problem will be felt by them, their family and their community. Not everyone will want or need long-term treatment, sometimes a briefer intervention can be more helpful. We will work with each client to understand where they are in their own journey, so we can tailor treatment to give them the best possible outcomes. We have good short form screening tools available and we are keen that a broad range of services who may encounter those affected by problem gambling use these tools to refer into treatment services. We can provide training on how to use these tools and empower people to have meaningful conversations about gambling so that those affected can make positive changes. As I mentioned, along with our ‘Motivating Behavioural Change’ training, operators can now refer customers directly to our Advisers on the National Gambling HelpLine. We also have a successful youth outreach programme which provides free workshops for young people to help them gain awareness knowledge and skills to make safer choices around gambling, understand more about problem gambling, and ensure they know where to access support should they or someone they know need it. We also offer free training to professionals working with young people to ensure that they recognise risk factors, signs and symptoms, can interact with young people about gambling and problem gambling, and likewise know where to access support should they need it. Promotion for this programme is very helpful. For those wishing to find out more about GamCare, how can they contact the organisation as well as obtain a copy of the GamCare Strategy Report 2018 /21? Visit www.gamcare.org.uk to view our full strategy document, email info@gamcare.org.uk or call us on 020 7801 7000 for more information. If companies need a copy of our updated logo, including our ‘Problem Gambling Support’ logo, email info@gamcare.org.uk to arrange this.